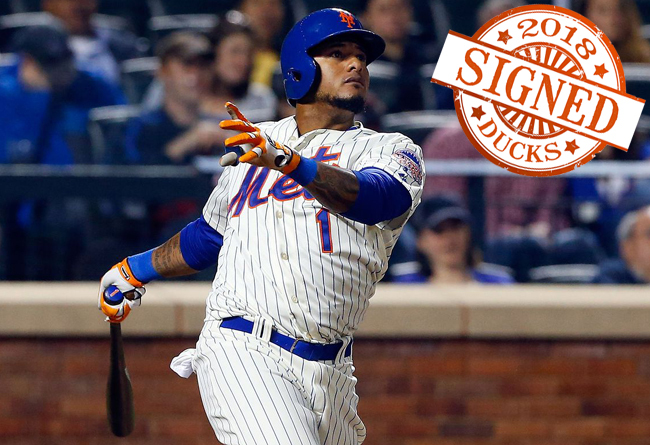 (Central Islip, N.Y., March 15, 2018) – The Long Island Ducks today announced the signing of infielder Jordany Valdespin. The former Major Leaguer will begin his first season with the Ducks and 12th in professional baseball. Valdespin is a four-year MLB veteran, having spent two seasons with the New York Mets (2012-13) and two with the Miami Marlins (2014-15). He totaled 15 home runs, 52 RBI, 52 runs, 14 doubles, three triples and 15 stolen bases in 214 big league games. The Dominican Republic native burst onto the scene in 2012 when he broke the Mets’ franchise record for pinch-hit home runs in a single season with five. He also collected his first Major League hit, home run and RBI in the same at-bat when he launched a ninth inning three-run homer off Philadelphia Phillies closer Jonathan Papelbon on May 7 of that year. In doing so, Valdespin became the first player in MLB history to record his first home run off a player with 200 or more career saves. The 30-year-old spent the 2017 season with Olmecas de Tabasco and Leones de Yucatan in the Mexican League. He combined to play 72 games and posted a .332 batting average with four homers, 37 RBI, 48 runs, 13 doubles, four triples, 15 stolen bases and a .418 on-base percentage. The lefty hitter was previously named a 2011 Eastern League Mid-Season All-Star with Binghamton (AA, Mets) when he batted .297 and set career-highs in nearly every offensive category. He was also selected as a Rising Star during the 2010 Arizona Fall League when he compiled a .355 batting average with the Mesa Solar Sox. Valdespin was originally signed as an undrafted free agent by the Mets in 2007.